Free Local Delivery for Orders Over $50! Serving you at two convenient Washington locations! 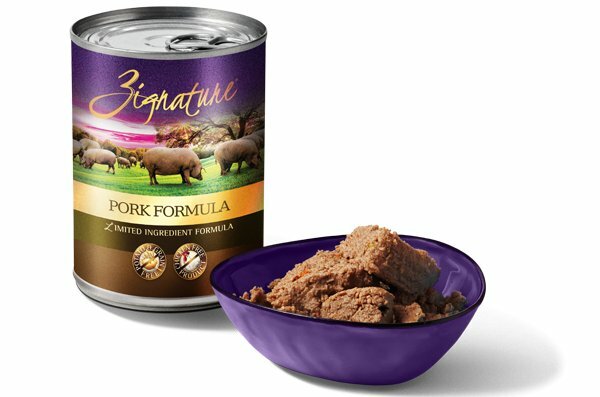 Our Pork Formula is a high protein dog food, as pork can have a protein content as high as 89%. As a source of complete proteins, pork is the healthiest dog food, providing a healthy amino acid profile. Pork is also rich in thiamine, making it the best dog food alternative to other dog food. To balance out the naturally rich vitamins and minerals in pork, we’ve made this formula grain free to provide a hypoallergenic dog food for your pup. The healthiest pet food is a limited ingredient dog food that’s extremely palatable and delicious. Pork, Pork Broth, Pork Liver, Sunflower Oil, Peas, Chickpeas, Agar-Agar, Tricalcium Phosphate, Calcium Carbonate, Choline Chloride, Salt, Potassium Chloride, Minerals (Iron Proteinate, Zinc Proteinate, Manganese Proteinate, Copper Proteinate, Mangnesium Proteinate, Sodium Selenite, Calcium Iodate), Vitamins (Vitamin E Supplement, Thiamine Mononitrate, Niacin Supplement, Calcium Pantothenate, Biotin, Vitamin A Supplement, Riboflavin Supplement, Vitamin D3 Supplement, Vitamin B12 Supplement, Pyridoxine Hydrochloride, Folic Acid).